(TibetanReview.net, Sep21, 2017) – As a security measure during the 19th National Congress of the Communist Party of China, scheduled to open in Beijing next month, China is to shut out Tibet for non-Chinese foreign visitors from Oct 18 to 28, reported the AFP Sep 20. China has not officially announced this move, like in the past, for similar purposes. The report said that though the Tibet Tourism Bureau had not released an official announcement, like on previous occasions, several local travel agencies had reported receiving the notice earlier this month. 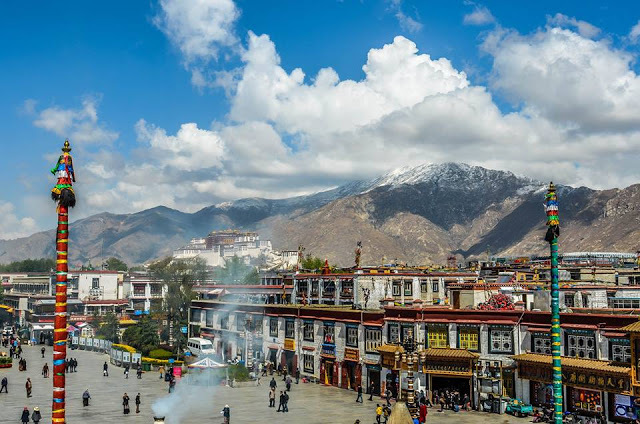 Under the notice, Tibet will close its borders to non-Chinese foreigners, while visitors already travelling in the region during that period will be required to leave by Oct 17. The 19th National Congress of the Communist Party of China will open on Oct 18 in Beijing where tough security measures have already begun being implemented. In this connection, the Tibetan Service of Radio Free Asia (Washington) Sep 19 reported that a Tibetan traveling to Beijing this week was refused a room at a hotel after showing his identification. Rather, he was taken by police to a special facility set up to accommodate Tibetans under supervision. “The police questioned me about my reasons for visiting Beijing and how long I was planning to stay,” the report quoted the man as saying. He was ordered to report to them again before leaving the Chinese capital. He was cited as having heard earlier that an Uyghur person was harassed at the Beijing airport for belonging to this minority group from Xinjiang. On Sep 19, China’s official Xinhua news agency cited President Xi Jinping as having called Stability an absolute principle that needed to be dealt with using “strong hands”. He was reported to have called on people working in the public security sector to improve their political awareness and maintain the authority and unified leadership of the party. “Xi noted that development and stability were the absolute principles, so both should be dealt with by strong hands,” the SCMP.com Sep 20 quoted the report as saying. During the five-yearly party congress, Xi will seek to consolidate his already tight grip on power, the report added.